ECO-FRIENDLY:NO Butane, NO Gas, NO Fluid, NO Hassle, NO Problems at All. 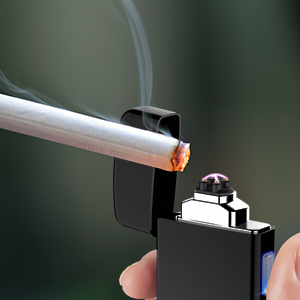 This USB lighter is environmentally friendly and can be charged via USB cable (included). It is perfect as Outdoor Lighter, BBQ Lighter, Candle Lighter, Stove Lighter, Wedding Celebration Utility, Fireplace Starter; Emergency Fire Starter Tool. 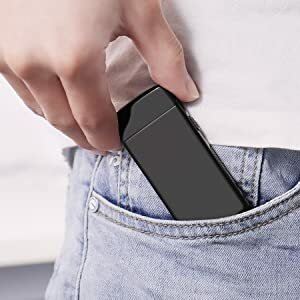 Rechargeable & Reusable:The built-in high-performance lithium battery, can be used up to 100-150 times (about 200 cigarettes) with just 2 hours full charge. The blue led light will indicate if the battery needs to be recharged (blue light flash) or if the battery is fully charged (blue light off). 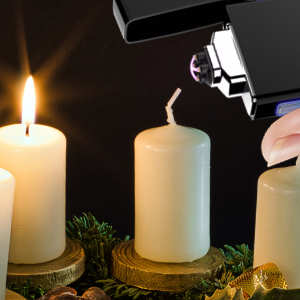 Windproof & Flameless: The Anglink Arc lighter can be used in most circumstance as it is Windproof and flawless but is suggested to avoid direct contact with water, and to prevent scald and burnt is recommended to don't touch the arc with the hand. Safety Feature: The Anglink Arc lighter feature a large and safe lid to avoid any accidental or unintentional use of the arc lighter. Please keep out of children reach. Unique Patented Design: The unique double electronic arc ignition patented design uses an innovative technology to solve the problem of the traditional arc lighter which can be limited by narrow space when it is ignited. While the Anglink Arc lighter can light things with flat surfaces like bowls and pipes. What do you get: ARC Lighter, 1*USB2.0 Cable, 1*Gift Box, 12 Month Warranty. We strive to provide you with the highest quality product and the best customer experience with a long warranty. But if you're not entirely satisfied, please contact us, we're here to solve your problem. The blue light will be flashed when the battery is running out, the blue light will be off after fully charged. the lighter arrived in an nicely designed package with foam around the lighter itself and an included short micro USB cable. This lighter feels sold and has a shiny gunmetal finish. I would have preferred a matte, rubbery finish so that is was not slippery and doesn't show fingerprints but it is attractive looking and weighty. 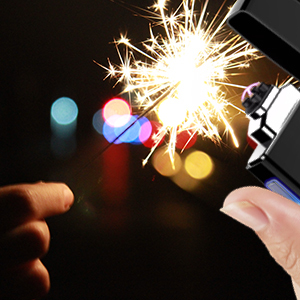 Great lighter and fun to play with. Very cool. Solid material and a little weight to it, feels good in my hand. I was worried the cap would get in the way for something like a candle, but it didn't. Works great so far. Very impressed with how fast it ignites things. What a great little gadget. Arrived quickly, and charged. So far i have use it to light incense, cigarettes, a pipe, gas stove, candles and a tiki torch. If you can touch the item to be lit, it fire right up. The black powder coat looks good and will likely be durable and stay that way. Simple yet elegant design visually. I like the charge / "on" indicator light which reminds me to close the top after use. I also like that a charging cable is included, along an instruction sheet. What is there not to like? Everyone who has seen it in action says "I want one" - especially once I tell them it was only $13.99! I use this to light the candles. Does the job better than those long lighters you use for bbq. Highly recommended! My husband is in LOVE with this lighter!! We have never seen a lighter that you could plug in and charge. Usually have to fill lighters or buy the disposable ones. This Ark Lighter needs no fluid! 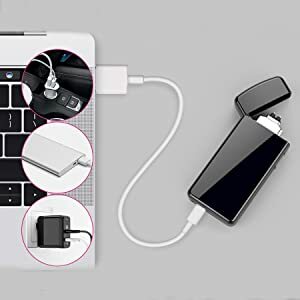 It's as simple as charging it with a usb cord, and that's it! It works great, and you seriously will never need a lighter again... as long as you keep it charged! I may have to purchase one for my son too! Thanks so much! Seriously the best lighter out there! !